Hi everyone! I did a post last summer featuring my Aunt Jody's beautiful hydrangeas HERE. They were equally beautiful this year, and when she brought me a large bunch, it inspired this table which would be great for Thanksgiving! Honestly, I would never think of using my mother's vintage Noritake "Condoro" for fall because it seems so "spring" to me, but when I saw the color of the hydrangeas with it, I knew I had to put it together. I also used a Mikasa "Italian Countryside" dinnerplate. I looked for yellow and orange maple leaves since the china has these colors in addition to the green. These will last at least overnight before they start to dry and curl up, so just plan on cutting them right before you need them. 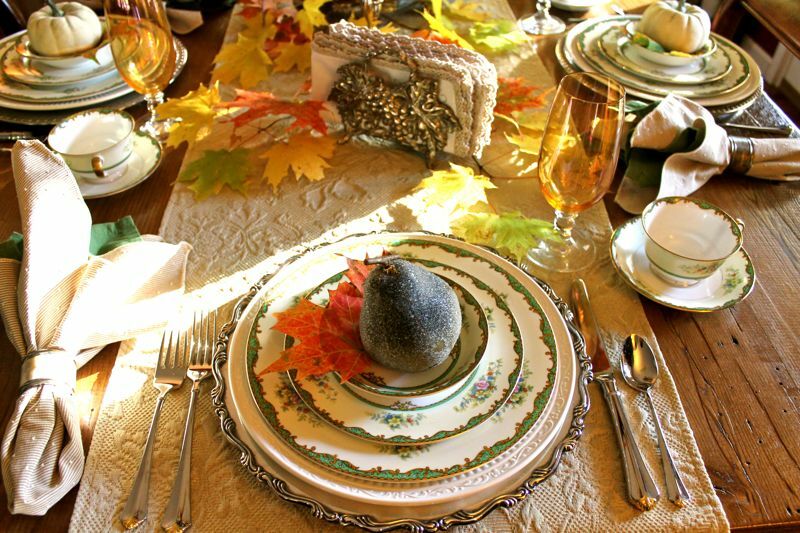 I have used Oneida "Golden Julliard" flatware, vintage silver trays for chargers, Walmart mother of pearl napkin rings mixed with vintage silver napkin rings, and the same Pier 1 amber glassware from last week. I put the hydrangeas in a Poole "Lancaster Rose" vintage silver wine bucket along with some "weeds" that I love to use, and placed that on a silver tray filled with antlers, gourds and pumpkins. 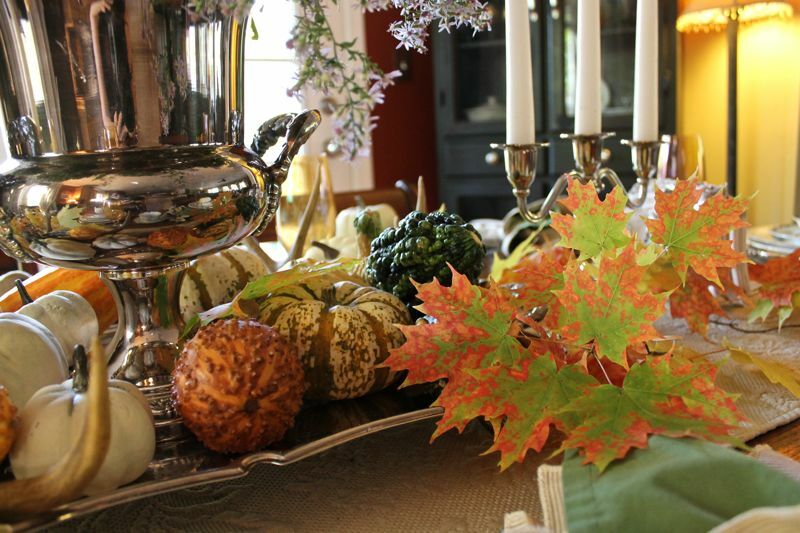 Taking inspiration from nature, I combined some traditional and some not-so-traditional elements for a fall tablescape. I hope that inspires you to step outside the box and use something you might not have thought of in combination. 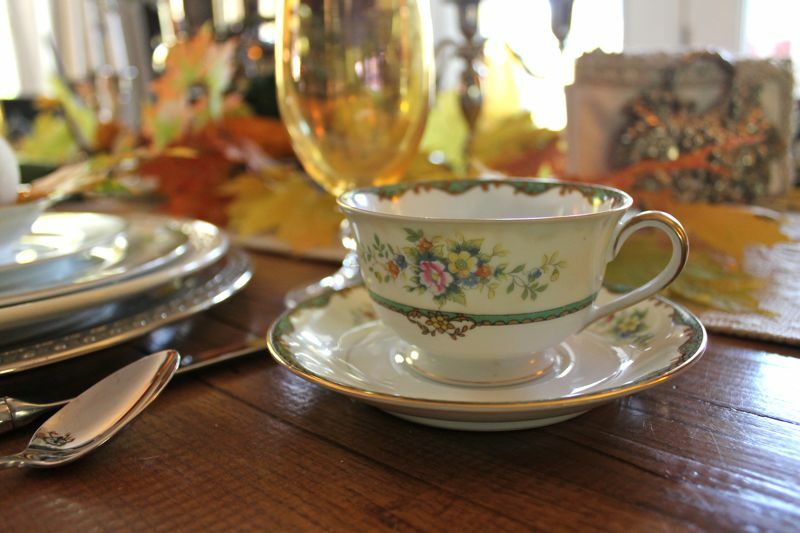 I'll be joining Tablescape Thursday and Vintage Inspiration Friday. Anita, as always, this tablescape is just stunning!! I always get so much inspiration here, as I love your use of color!! Hydrangeas are my faves; and they are absolutely gorgeous on this table. You have showcased them beautifully!! Thanks so much for sharing!!! Gorgeous table, Anita. Oh yes, those hydrangeas really compliment that lovely china beautifully. The leaves are so vibrant...this year ours just turned brown, then fell. What a beautiful table!! I especially love the maple leaves on around the light. Gorgeous! Beautiful! simply beautiful! You come up with the neatst ideas! You bet those dishes work for Fall Anita. I love this table scape. Every table you do Fall inspired are my favorite. 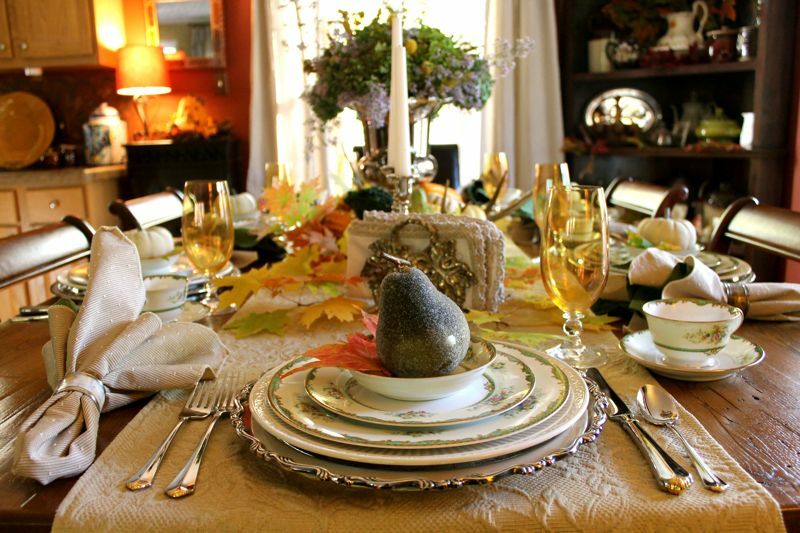 Anita, your amazing, the table scape reminds me of elegant Sunday dinners that memories are made and never are forgotten. I love the gorgeous pattern, Your mother, of course has excellent taste.The silver chargers are a favorite heirloom I enjoyed reading about in your past posts.I love hydrangeas, my grandmother even grew them in her sandy soil beach home gardens. I love visiting your blog, the past is continued with respect and tradition passed on to your children.Thank you for the hospitality and warm welcomes. Just beautiful! I love the hydrangeas with the china!! 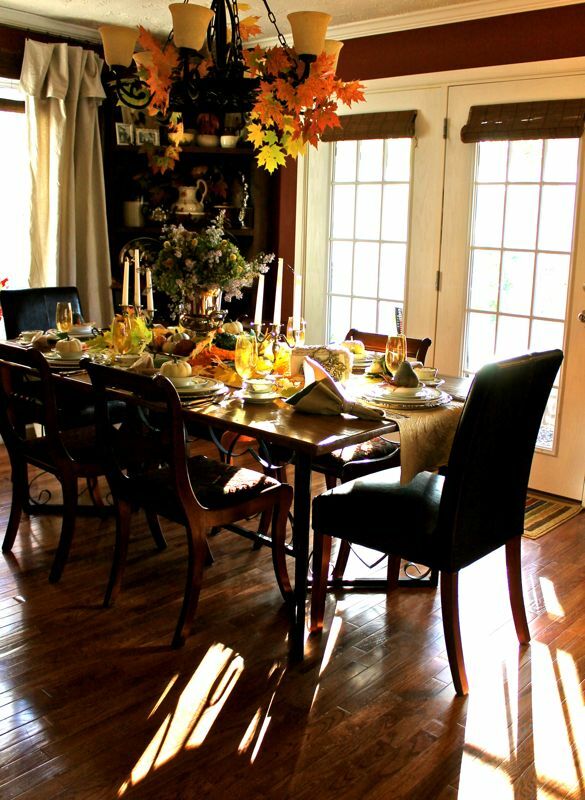 Your table looks lovely and the sunlight pictures are beautiful!! Happy Fall! Oh this is beautiful! The sunlight streaming through the windows makes the whole thing look radiant. 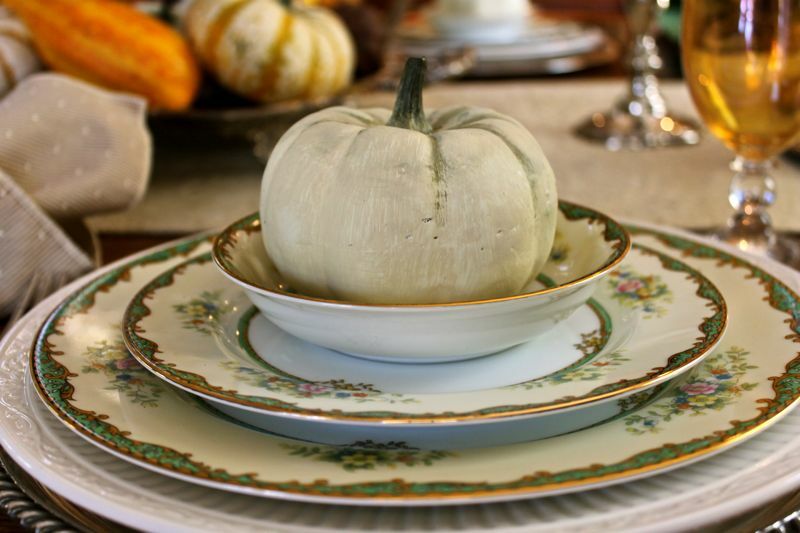 I love the table runner & the china is versatile enough to work for Fall. Wow, Anita...you really went all out for this table! It's beautiful! The sentimentality behind the china makes it a perfect choice! The colors can certainly be associated with fall, too, so "it's all good" as the young people say! Your leaf treatment on the light fixture gives me inspiration, but I think I'm too late. It was 80 degrees here yesterday and the day before, but it has now plummeted to the 40s with a cold, blustery wind, rain, and a threat of snow tonight. I think my window of opportunity has shut tight! :-( I can always just look at yours and dream! Beautiful! no matter what we have to serve. Thank you for such invaluable service desk. So gorgeous! You know I love those silver chargers and the gold glasses are so beautiful! 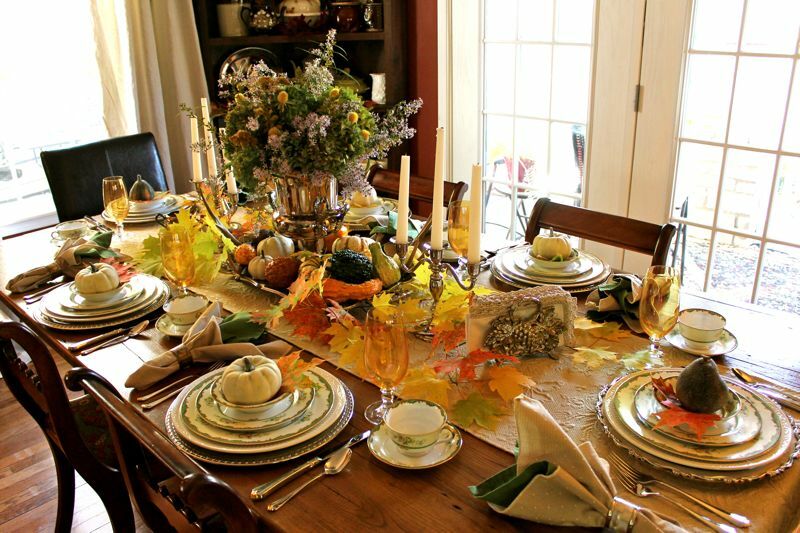 Your Tablescape is Gorgeous for fall!! I love your Beautiful Dishes and the centerpiece..You always have a way of putting it all together for a dinner party great job. Thanks so much for your sweet comments on my tablescape. Wow! 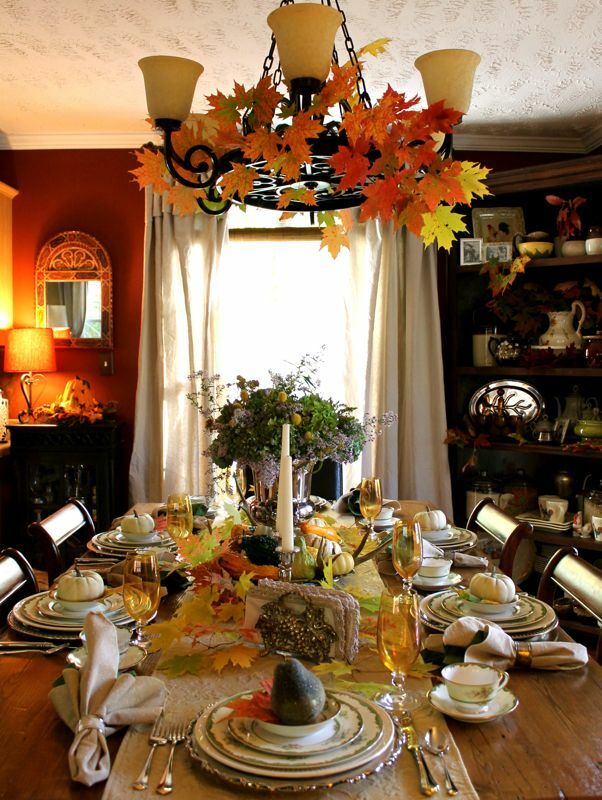 I love the china mixed with the Autumn colors and the centerpiece is truly stunning! Your dining room is spectacular too! So beautiful Anita! I love the hydrangeas, such a pretty centerpiece. I also really like the matelasse runner. Great job! Anita, this one is breathtaking to me. I love that china mixed with the silver and then with the autumn colors. Once again, I tried not to covet your beautiful foliage. I love the vintage trays for chargers. They were one of the first things I noticed. One of the most beautiful tablescapes I've ever seen!!! Your table is beautiful! I love all of your china. The colors blend so beautifully. Another gorgeous table, Anita! The leaves are so pretty. Love the centerpiece, too. Thanks for the note you left recently on my blog! Hope you're doing well and having a wonderful fall! I love the way you put this together, Anita. I would have never thought of that china for fall but you make it work perfectly. I love the hydrangeas. I have one on my patio that actually made it through the summer but no buds of any kind at all. We'll see. I love your vintage trays. 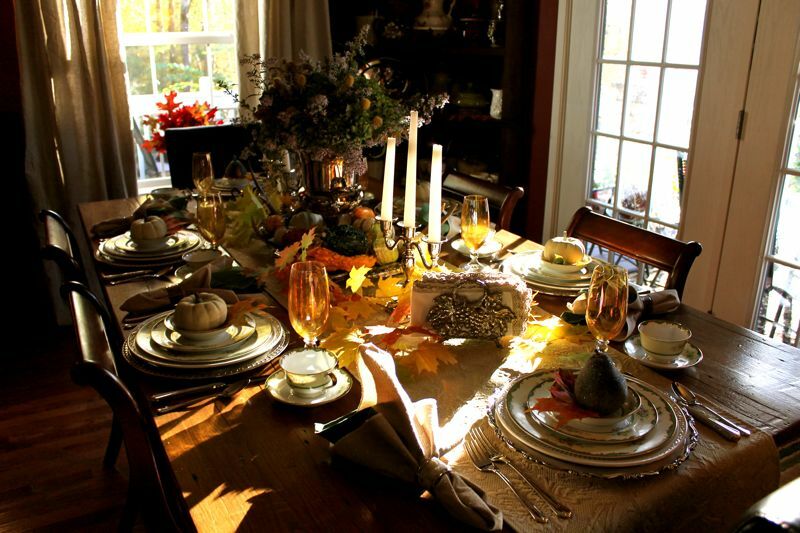 Your table, with the setting sun, could not be more autumnal and elegant. 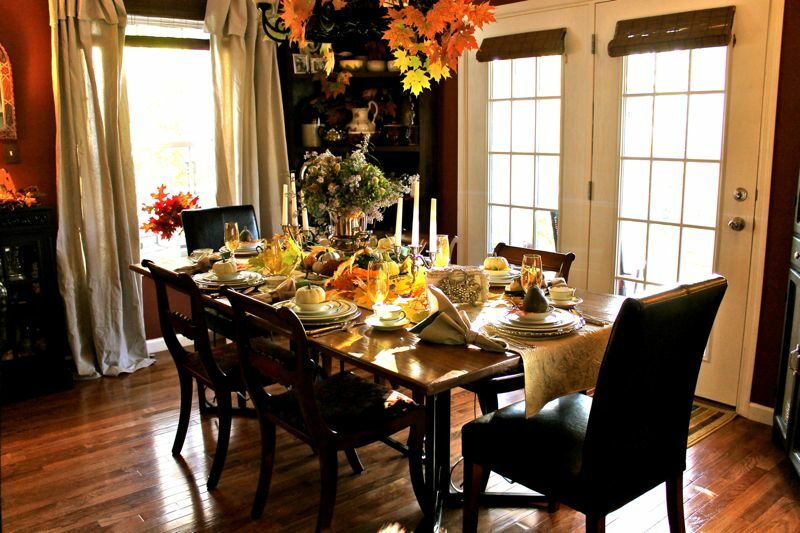 First off, your dining room is beautiful! I love the lighter colors in your table! Your dishes are lovely and your inspiration hydrangeas make a wonderful centerpiece! Hello Anita~What a gorgeous and elegant table scape!! 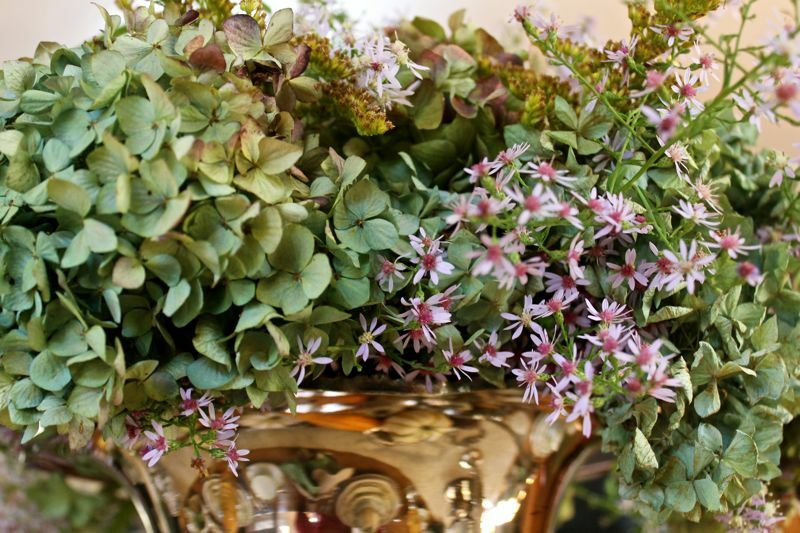 Love your beautiful silver ice bucket :) and the dinner plates are just beautiful!! 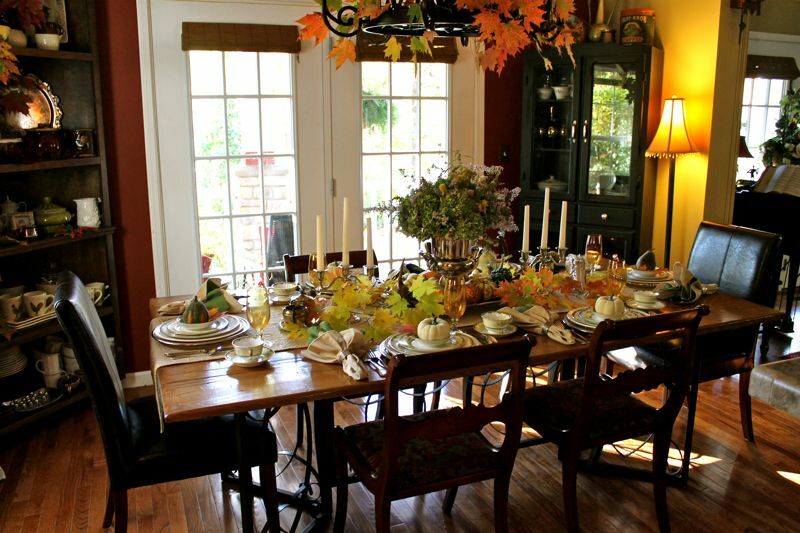 Your tablescape looks wonderful Anita! I think the china looks so perfect too. Our hydrangeas are just starting to flower now! I am very excited! Hi Anita! Your tablescapes are always so beautiful. There's a warmth to your table, your home... just beautiful. 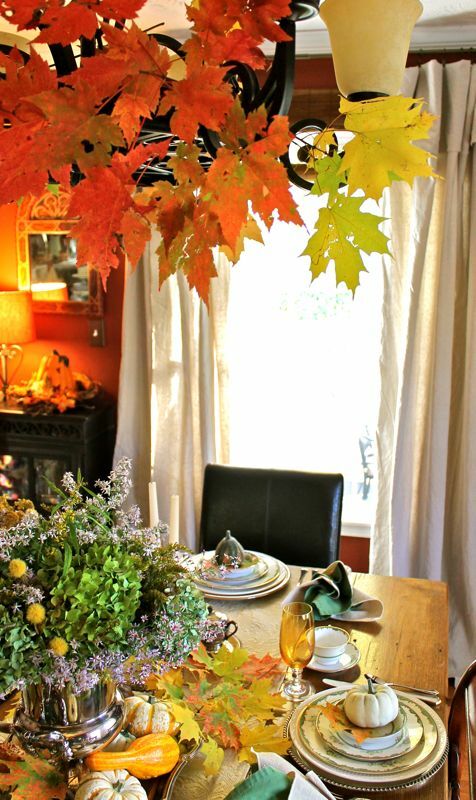 One of my favorite settings is the table for two on your porch with the windswept leaves all around. So earthy, inviting and I'm sure your husband thought it was very romantic! I also just love the rich wood finish you gave to your dining chairs. I remember when you refinished them. They truly are like works of art! Enjoy a lovely, lovely weekend! so charming. I love your mix of new and old. 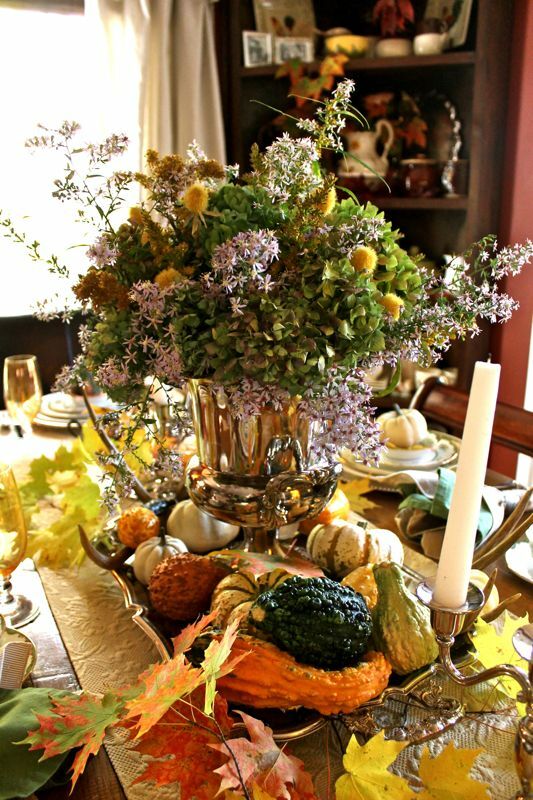 This is a beautiful table setting- wish I could dine there. Gorgeous table!! I LOVE that china pattern. And your centerpiece is just beautiful. Beautiful tablescape! Your centerpiece is just stunning! I love the hydrangeas and I am just in awe of all the beautiful other flowers that you added to compliment them so well. Your chargers are fantastic. Gorgeous,gorgeous,gorgeous setting!